is around 10-13 years, although a few Glens live to 14 or even as much as 17.
breed, Glens are supposed to have a crooked front with front feet turned out. blood test for their breeding stock to accomplish this! 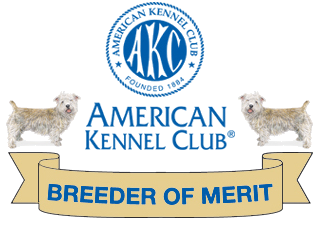 desired characteristics and health of our breed. have a genuine Glen of Imaal Terrier breed to work with. below 25%; I personally strive for less than 20%, although this is not easy. An excellent resource for depth of pedigree and inbreeding coefficient information is the Glen of Eden Database. university researchers in both Europe and America while pursuing our PRA problem. PRA exam status for previous years and now the more reliable genetest results.